VCF to CSV Converter supports vCard contacts from various email applications like WLM, iCloud, Outlook, G-Suite, Mac Address Book, Android, iPhone, Mac Mail, WhatsApp, Apple, Entourage, Blackberry, etc. The VCF to PST converter is providing an option to import multiple vCards into Outlook at once on any Windows OS (10, 8.1, 8, etc). Users are additionally equipped with a feature to create a single PST file for all browsed VCF file contacts. The VCF to CSV migration application offers a quick solution to transfer numerous VCF files to Excel format. It extracts all contact attributes from source vCard files and saves them in .csv. The attribute can include names, email id, nickname, etc. The vCard to CSV converter is giving a provision to separate VCF file (having multiple contacts) in single vCard file for each contact. Software smartly separates browsed files and saves them at the user defined location. 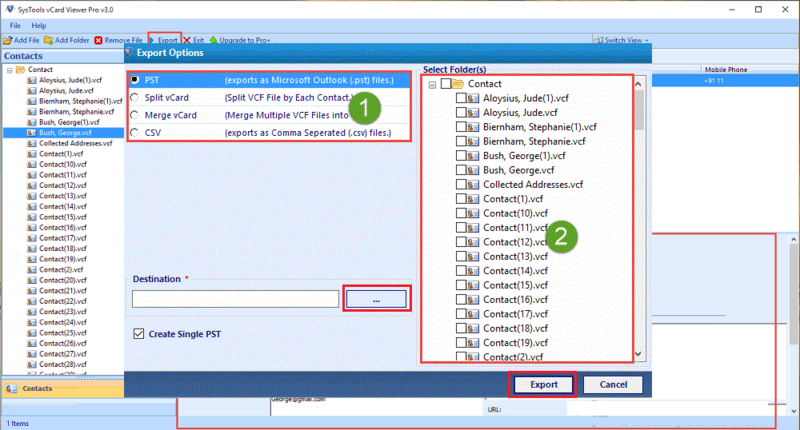 The VCF to PST converter enables users with an option to merge bulk vCard contacts into one file. This can easily be done just by browsing several VCF files either in one-by-one scenario (Add Files) or in a collective manner (Add Folder). Prior to the vCard to PST, CSV files conversion procedure, the software provides facility to preview browsed VCF contact information. Users will independently be able to open and read vCard files at a time with same data as it was at the time of creation or after modification. The vCard to CSV converter provides a feature of selective file conversion. Once users have clicked upon the Export button, they have to check all those VCF files that they want to export. The chosen activity will be performed only on all those vCard files whose checkbox are checked by the end user. With the help of VCF to PST Converter, one can easily export a bulk number of vCard contacts or files to various file formats at the same time. There is no data loss during the conversion process. 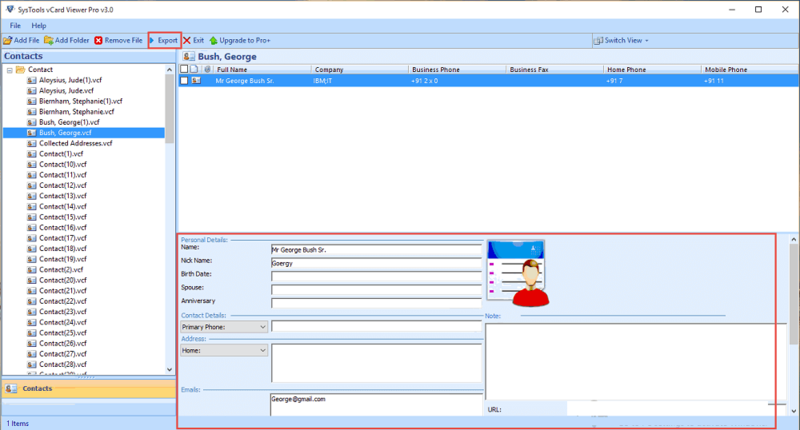 vCard to PST converter allows a user to sort all the contacts in VCF file in any desired order. 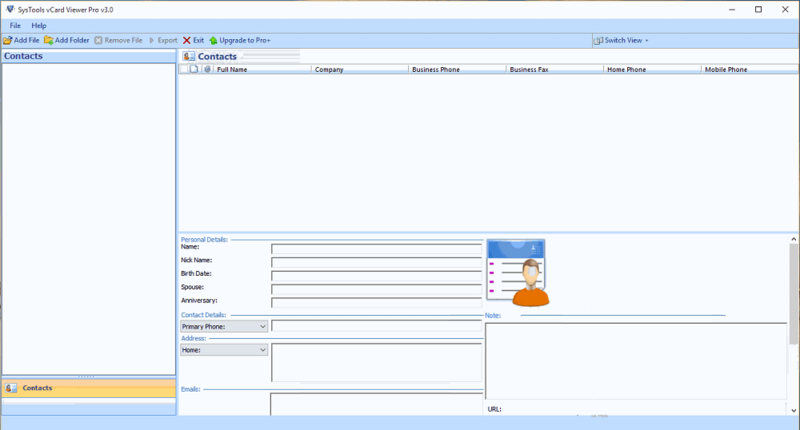 Sorting of contacts can be done by size, date, alphabetical order, etc. It is easy to manage a large number of contacts. VCF to PST, CSV Converter Supports to Only Preview Different Types of vCard Files Supported in Outlook, G Suite, ICloud & Skype etc. Explain the working of VCF to PST, CSV Converter Tool? Step 1: Install & run vCard to PST, CSV Converter Tool. Step 2: You need to Click on Add File or Add Folder option to add single contact or multiple contacts. Step 3: After browsing the file or folder, add to the software. Step 4: The tool will load each and every contact from the VCF file. Step 5: You can select multile contacts to export them to PST, CSV file format. You can also merge multiple contacts into a single file or separate each contact into separate files. Is it possible to convert Nokia VCF to CSV format with help this software? Yes, our vCard to PST, CSV converter tool supports .vcf file of all its creating applications or OS. This can include mobile phones OS, iCloud, all desktop-based email applications, and web-based email clients. 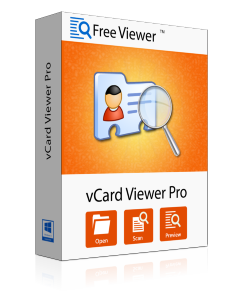 Can I work with this FreeViewer vCard to Outlook converter on Windows 8.1? Yes, the software is a Windows-based utility, which is compatible with Windows 10, 8.1, 8, 7, and all prior editions. Will this updated version of the Tool support corrupted VCF files? Yes, this pro edition will work with corrupted VCF files. It will extract all contacts from browsed vCard file and provide different options to save them. With what option I should go for to collectively browse 150 VCF files in your vCard to CSV converter? The best option for browsing multiple vCard files in the software is to opt for Add Folder. You just place all the source VCF files in one folder and then, directly browse them in software. Does your software supports altered or modified VCF files? Yes, our tool is workable with modified as well as altered vCard files. It will be exporting contacts with same data integrity as it was before processing. "I have to state that if someone is searching for a solution to import multiple vCards into Outlook at once then, they should go for this converter. The software is amazingly developed with all useful features that are required to deal with VCF files. I utilized the software to create a backup of VCF file, which was exported from my phone i.e., Redmi 3S Prime. It was a great experience while working with this product and I will recommend it to all who are looking for the same." "The software is a comprehensive approach to tackle with VCF files. This one application acts like a VCF to PST / CSV converter, splitter, as well as a merger. By spending few dollars, I was able to accomplish several activities from one software itself. There is no limit of VCF file size or numbers while working with this multifaceted application. I extremely like the way it works & heartily wants to thanks FreeViewer team for coming up with such a brilliant tool." "With the help of VCF to CSV, PST Converter tool, I was able to convert a bulk number of contacts in multiple VCF files into PST file format. All thanks to FreeViewer team that has developed this product. Now, I am able to view all the contacts in Microsoft Outlook email application. The tool is enough flexible that it supports VCF files from multiple applications. That makes it efficient!" "VCF to PST Converter helps me a lot in merging multiple contacts into a single VCF file. Now, I can easily open and view all the contacts in a single file. I can also export vCard to CSV format that makes it portable to any application. Therefore, I can open & view contacts in any application. Thanks for such an efficient tool!"